Government and church officials have praised the late archbishop of a southern Vietnamese archdiocese for bringing love, care and joy to other people. Archbishop Paul Bui Van Doc of Ho Chi Minh City died of a stroke on March 6 in Rome while he and other Vietnamese prelates were visiting the Vatican. 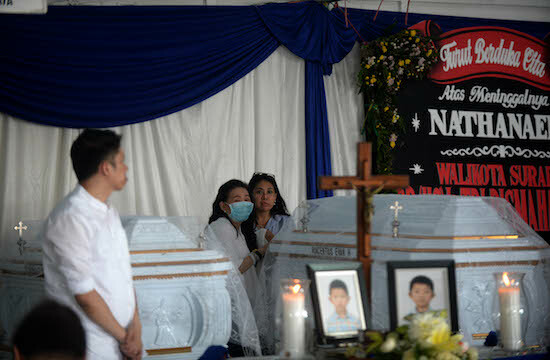 His body was sent back to the Archbishop's House on March 15 and moved to Notre Dame Cathedral the following day for Catholics to visit before his funeral was held at the Pastoral Center on March 17. People visited and prayed for him around the clock, while 10,000 attended his funeral. Deputy Prime Minister Truong Hoa Binh described Archbishop Doc as an outstanding dignitary with an important role in building and developing the church in Vietnam. He was "a gentle, kind-hearted and humble pastor who had good relationships with all people." The former head of the Vietnamese bishops guided Catholics to journey with the nation, build the fatherland and brought followers of religions to unity, Binh wrote in the funeral book. 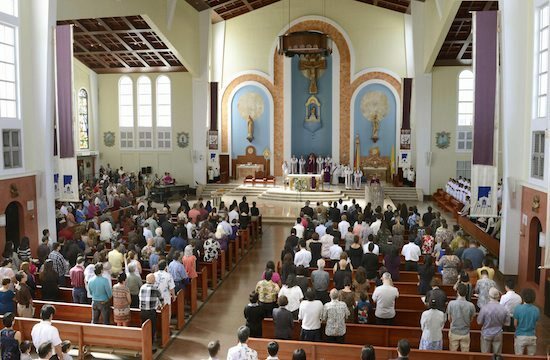 Nguyen Thien Nhan, Communist Party secretary of Ho Chi Minh City, said Archbishop Doc had worked closely with government agencies and shared the challenges and achievements of the city. "He called on local priests, the religious and laypeople to carry out well Pope Benedict XVI's message that good Catholics are also good citizens," he wrote in the funeral book. Nhan said the passing of Archbishop Doc was a great loss for the Catholic Church in Vietnam and the city. He also offered incense and prayed for the deceased's soul to rest forever in the light of the Resurrection. President Tran Dai Quang, former prime minister Nguyen Tan Dung and leaders of ministries, sectors, neighboring provinces and domestic and foreign organizations sent wreaths to pay tribute to the archbishop. State-run Tuoi Tre newspaper said the late archbishop, whose episcopal motto was "God is my joy," lived with joy and brought joy to other people, regardless of their faiths. The newspaper commended him for taking care of all God's children, especially poor people in remote areas. Archbishop Doc celebrated Mass on the eve of 2018 at a mission station in remote Nha Be district. The newspaper also praised him for "living a humble life and not hesitating to apologize for his mistakes." On his inauguration as archbishop of Ho Chi Minh City in 2014, he said: "Please pray much for us, your pastors, and forgive our mistakes while we serve you." Archbishop Joseph Nguyen Chi Linh, head of the Catholic Bishops' Conference of Vietnam, presided at the funeral concelebrated by Cardinal Archbishop Peter Nguyen Van Nhon of Hanoi, Emeritus Cardinal John Baptist Pham Minh Man of Ho Chi Minh City and bishops from the country's 26 dioceses. Some 700 priests also joined the ceremony. In his homily, Cardinal Nhon, 80, said the late archbishop was influenced by the spirit of Vatican II while he studied theology and philosophy at Rome-based Pontifical Urbaniana University. He transferred Vatican II's spirit to many priests when he taught at seminaries, the cardinal added. Cardinal Nhon, a close friend, said the late archbishop had lived a life of prayer and dialogue.